Nottingham, United Kingdom– 23 October 2018 – VoiceFoundry, a principal provider of enterprise cloud-based contact center solutions with a unique focus on customer experience and automation in North America, Australia and New Zealand, today announced that it is expanding consulting services for Amazon Connect to the United Kingdom. VoiceFoundry is passionate about customer experience. We deliver cloud-based enterprise Contact Center solutions that are uniquely focused on helping businesses improve customer engagement, while maximizing the benefits of the cloud. 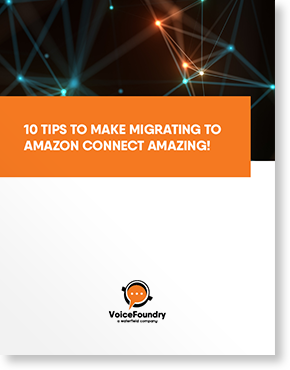 VoiceFoundry makes it easy for customers to quickly and effectively deploy or migrate to Amazon Connect for their Contact Center operations. Our expertise is focused on AI & natural language automation, CTI, enterprise integration, user experience design, analytics and workforce optimization. With a relentless pursuit of customer success, our team strives to disprove the notion that software projects have to be painful. For more information, visit us at. www.voicefoundry.com.